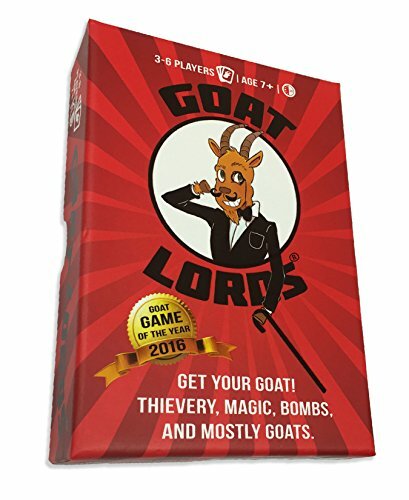 DONALD TRUMP GOAT ONLY INCLUDED IN GOAT LORDS EXPANSION --- 1 RATING from DCM FAMILY, INC. "Funnest Card Game I've played since Monopoly Deal." - D.J. OUTRAGEOUS BOMBS, MAGIC, AND ACTION increase the GOAT-tensity as strategy is needed to win the coveted title "LORD OF THE GOATS!" ORDER YOUR GAME WITH CONFIDENCE knowing our company guarantees fun and magical wonderment! We maintain the highest quality and we guarantee your complete satisfaction, or your money back! Join the GOAT LORDS madness by sending this little goatee to the market...I mean the shopping cart, and consider getting another one for your best gamer friends!